Formed 1886. Wound up 1900. Elected to Division Two 1895. Failed re-election 1900. 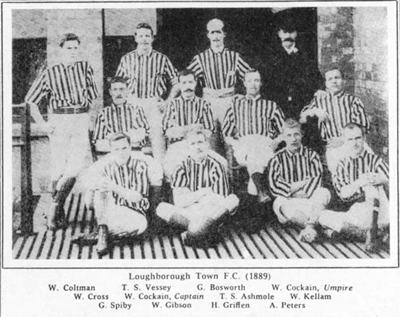 In 1891 Loughborough, joined the Midland League, winning the championship in 1895. As a result the club applied successfully for a place in the Second Division of the Football League. They finished twelfth in their first season in the Football League, their highest ever position but from then on it was all downhill. Between 1898 and 1900 they were forced to apply for re-election on three consecutive occasions. After finishing last in 1900 having amassed a mere eight points from 32 games and conceded 100 goals, the club could muster only three votes. Loughborough was accepted back into the Midland League but folded before the season began. The name of Loughborough has been revived twice. In 1988, Loughborough J.O.L. (formerly Thorpe Acre Hallam F.C.) changed their name to Loughborough FC and competed in the Central Midlands League but folded in 1990. In 2001 the previously mentioned Loughborough Athletic FC changed their name to Loughborough FC. This club currently competes well down the football pyramid.